Soccer is the World's Sport, and as such there are thousands of soccer teams in World Soccer. Since we are World Soccer Shop it is our always our mission in life to scour the globe or the world to bring fans new and rare teams, of every level. Big nations, and small islands, we will get it and offer it to their fans. And, as you may or may not have noticed, we treat all our products with the same class and dignity the team and its fans deserve. Having said that, it brings us great pride to introduce for the first time on WorldSoccerShop - Club Olimpia. 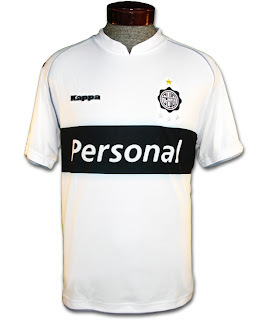 The Official Kappa Olimpia 09/10 Home Soccer Jersey. You may not have heard of Club Olimpia of Asunción Paraguay, yet they are by no means a small club. They are renowned in South America, mainly in Paraguay, where el Decano has won a whopping 38 First Division titles. Yet, what's more impressive is they have conquered one of the biggest tournaments in World Soccer - the Copa Libertadores - three times, the last one being in 2002 the year the celebrated their 100th anniversary or birthday. Ready for the World Football Challenge 2009?